They say that love makes the world go round – well it might be a whole lot more than just a feeling (or a verb, depending on which school of thought concerning love you lean on) in order to get an entire planet to spin on its own axis – as we have seen that in the Jupiter Solar Spinning Globe before. This time around, we are looking at something that is far closer to home (which would be the planet earth), and a whole lot more corporeal than just having plenty of gas around. Enter the $139.99 Mars Spinning Globe. 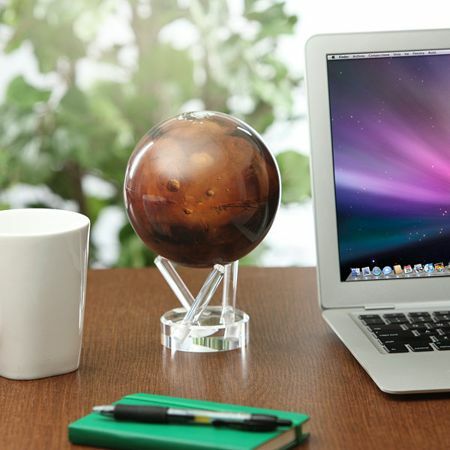 Yes sir, the Mars Spinning Globe would make for a mesmerizing option for any desk, as it will feature a planet that has been shrunk down to just 4.5” in diameter, and you do not have to worry about battery power since I suspect the Mars Spinning Globe would be very good friends with the other cactus plants that have been lovingly placed along the window sill by your desk, as it will feature low-light solar cells to keep the rotation going.